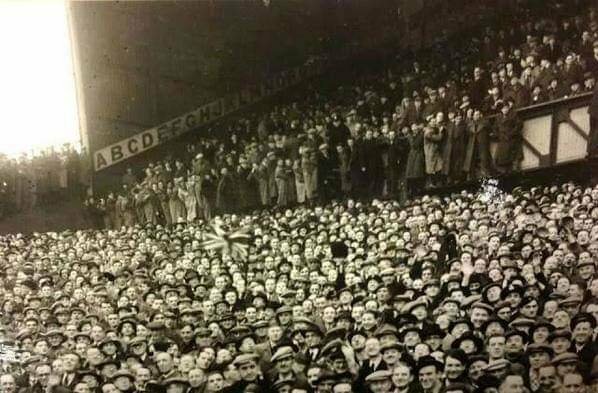 Not this season but a picture of the Main Stand at Ibrox when Rangers played Moscow Dynamo in 1945.
that was an important win for Rangers tonight. always difficult away to the sheep but they put in a great performance. Agree, a very important win. Always great to get one over the sheep. A great result for the 'Gers the other night. Good to see Morelos score 4. Tricky game in the next round but hopefully a repeat of the recent result in the league. Sadly, the league looks beyond them now but would be great to win the Cup. Although it is sadly looking like the lot from the dark side will win the title I do hope that Rangers beat them at their place this Sunday. Not a good first half and down to 10 men as well. Disappointing result yesterday. Annoying that Morelos was sent off again. 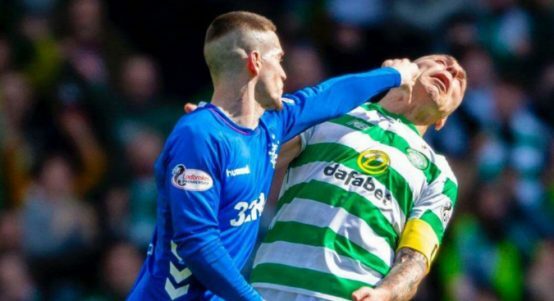 Only upside was Ryan Kent lashing out at the Lego Eater. what a season this has been. there are signs of progress and tbh I think Celtic are plateau-ing. we could've at least come away with a draw yesterday if Tav hadn't make a massive error. so for next season, we need a bit of maturity in midfield, we need to be more consistent, I'd add another striking option but the gap between Rangers and Celtic doesn't feel as huge as it did. think I need a bottle of this. Agree, Kent hardly touched Brown but the Lego Eater went down as he had been shot. Yes, could have come away with a draw. Agree that a bit more maturity and another striker. It will be interesting who they sign in the summer. Need to stop Celtic wining ten in a row. That would be horrendous. Thanks for posting the picture of the King William gin. Will have to treat myself to a bottle. it's made by some bloke in England and he named it because William III instigated a massive growth in British gin when he banned imports of French brandy. he's says he couldn't quite work out why he was selling so much of it to customers in Northern Ireland and Scotland ! Will have to treat myself to this. Curly's Bar is a place I know very well. Well done to the Gers. I wonder if other clubs will follow suit. I begin by again offering my most sincere thanks to each and every Rangers supporter for the continued commitment and understanding that you have shown throughout the recent rebuilding of our Club. It was never going to be easy and it is extremely gratifying to have witnessed the progress that has been made over the last year. We are now within tangible reach of Rangers becoming the dominant force in Scottish football again. Much of the progress on the pitch can be attributed to Mark Allen, Steven Gerrard and their respective management teams. Turning to a young manager was a risk but it was one that Mark and the Board felt we should take because of Steven Gerrard’s football pedigree. Steven’s passion, professionalism and winning mentality has been inculcated throughout the football activities at all levels and we have seen strong benefits from this. Of significance was our first, strong European campaign for many years. The team was heroic at times in battling through four very tough qualifiers and went on to narrowly miss making the knock-out stages. However, the inconsistency that inevitably comes with another new management team and a new group of players was also evident. We saw periods where we were rightly regarded as title contenders, followed by periods of varying quality. However, despite these periods of inconsistency it is clear that the playing squad is significantly stronger than in recent seasons and, importantly for future transfer activity, the overall value of the squad has greatly increased. This is a tribute to the work that Mark, Steven and their management teams have done to improve the process behind player recruitment and their overhaul of the training methods and the general wellbeing of the football squad at all levels and age groups. The team requires a further upgrade and the Board will continue to back Mark and Steven, who fully understand that Rangers must win titles and cups and plans are already in place for recruitment in the summer window. Rangers has always been a leader on and off the pitch. Apart from the aim of amassing titles and trophies, being part of Rangers as a fan, player, manager or director means we conduct ourselves in a specific manner. Our Club often comes under unfair attack and we are relentless in working hard behind the scenes, and up front when necessary, to make sure we are given the respect our Club and our massive support deserves. But we will not engage in unseemly debates through the media. Conducting ourselves with dignity is a part of who we are and it is up to us to set standards. However, in doing this, we will not allow ourselves to be treated differently or held to a different set of rules. The institution that is Rangers Football Club is special and has a unique place in football history as having won – by quite some distance – more trophies than any other club in the world. We must now start adding to this record but can only achieve this by remaining together and being stronger in our unity than other clubs. This season, a record number of season tickets were sold and it would be remarkable if we could again hit that number as we lay the foundations for what we hope will be the season which sees Rangers triumphant again. Your Board is committed to providing further funding and we are also asking for supporters’ help through renewing season tickets, which will increase in cost by only 5%. We feel this is not an excessive increase and every fan should know that the season-ticket revenue will solely go towards the first-team squad. We have also witnessed a significant advancement at the Academy under the guidance of Craig Mulholland and his team. This was evidenced by our under-17s who went to Qatar and won the prestigious Alkass Cup. This triumph – and the fact that more than 20 of our players across all age groups were called up for international duty recently – are clear signs that the Academy is doing a terrific job. Rangers is a massive club and our importance demands that we contribute to the broader community as a whole. No club in the country does more to help those less fortunate than we do. The Rangers Charity Foundation’s work goes mostly unheralded but through its various education, health and well-being, employability, diversity and inclusion programmes (as well as many others) it continues to be a force for good and has eased the lives of hundreds of thousands of people who need help in so many ways. In order to further boost our charitable activities we are proud, for the first time, to have included a £2 donation for the Rangers Charity Foundation as part of the Season Ticket payment. I know that all fans will support this initiative to help others. I sincerely hope that you will renew your season ticket for 2019/20 and thank you in advance for your continued support.